With my 21st birthday being a mere two weeks away today (cue the getting old remarks) I figured I'd post a little wishlist. I'll admit, it was difficult not to whack a whole load of beauty products on there and call it a day because there are so many gorgeous palettes and gift sets available this Winter but I tried my best to keep it diverse! 001. Next Bunny Slippers - I'm one of those people who is always cold during Winter and my current slippers have outstayed their welcome. Once I spotted these on the Next website I just had to add them to my list. I have the Bear slippers at my boyfriend's house and they're so comfy! 002. Guerlain La Petite Robe Noire - This is hands down my favourite perfume ever. I received a 30ml bottle of La Petite Robe Noire for Christmas last year and it was quickly used up, so I'd love another bottle. I normally get sick of perfumes after wearing them a while but this is completely different. 003. Charlotte Tilbury Uptown Girl Quad - It seems everyone has gone crazy over Charlotte Tilbury's makeup range since its release, and it's no surprise with the high performance product and luxurious packaging. Uptown Girl is the one quad I've had my eye on as the colours are stunning. 004. NARS At First Sight Palette - Continuing with my current NARS obsession, the At First Sight palette quickly made it's way onto the list. I love their eyeshadow formulations and have been wanting to try Laguna for a while, so why not grab a palette with a combination of the two? 005. Lush Stardust Gift Set - It's no secret that I love Lush products, particularly their sweet scents. The Stardust gift set contains 6 products including the famous Snow Fairy. 006. The Little Mermaid DVD - Because it wouldn't be my birthday without something Disney related. 007. Paul and Joe Face Wash & Makeup Bag - I honestly only added this to the list because of the makeup bag. I'm in dire need of a new one and this one from Paul and Joe is adorable. 008. Yankee Candle Snowflake Cookie - I'm almost finished my current jar of this candle and I love the scent so much. It's so sweet and sugary, I wish this was a permanent scent in their range! 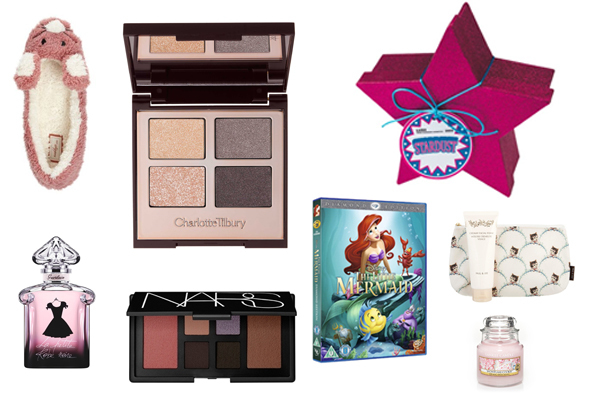 What's on your wishlists at the moment? Ah honestly the candle smells so good! That eyeshadow quad is lovely! Such lovely colours! I got The little mermaid for my 21st, it was realised that year after me wanting it for ages, I've now lost it so have it on my birthday list for this year!